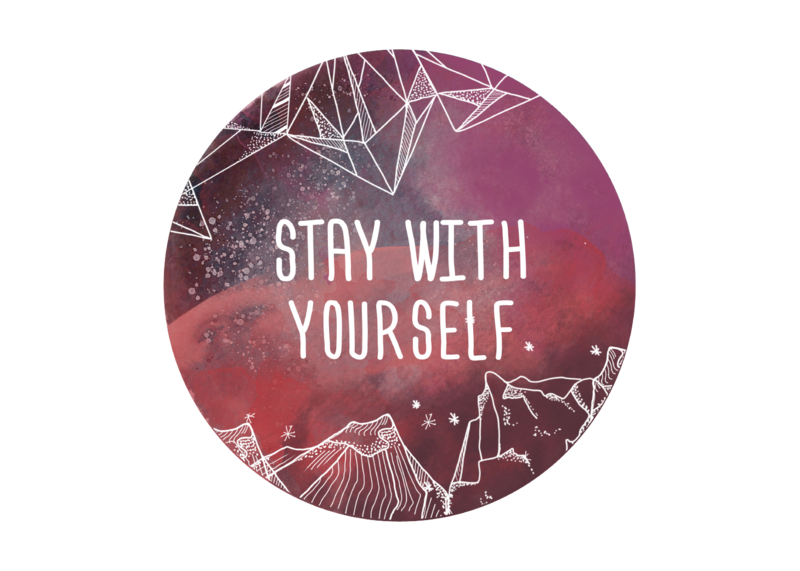 Did you know Stay with Yourself started as a storytelling co-op? Most of my life I have felt like the odd girl out… alone, weird, and different. Belonging has felt contrived and elusive. Even during times of inclusion I felt disconnected and misunderstood. I was never sure why. Over the years I’ve heard strange things come out of my mouth unbidden. My inner experiences sounded so different and one-dimensional when I put into words and spoken aloud. Because of this, I looked to the words of others to help me communicate. And, more importantly, discover the millions of unspoken things inside myself. Some of my greatest moments of awareness and awakening have arrived on the heels of another person speaking their truth. I haven’t always recognized my truth until someone else says it first. Only then can I properly identify what I’ve been feeling all along. My grandmother recently told me her generation was taught to keep silent. They didn’t talk about their feelings or the real truth behind thing. Even when the truth was obvious. It’s not just my grandmother’s generation who has experienced a silence of truth. It’s universal, and has been going on for a long time. We live in an age where image is everything. We fear being exposed for who we really are: Human. Being human is the first and most obvious thing we all have in common. Often times it’s the hardest thing to admit. No wonder so many of us feel alone and disconnected. Silence and pretense have separated us from ourselves and each other. If we don’t find our way back, we will slowly become lost and not know who we are. “Stories have to be told or they die, and when they die, we can’t remember who we are or why we’re here. Without stories – without knowing the truth about another person – we will never know the truth about ourselves. How can I know I am not strange, alone and different if I’ve never heard the tale of someone else’s experience? If I think my rejection or difficulty with words, or childhood abandonment, are unique only to me, I am instantly separated from you. But if you tell me a story about your own rejection… about the time your words didn’t come out right… about your own abandonment, I am immediately connected. My shame no longer has a place to hide. I can allow my heart to be seen. Stories are our greatest resource for fostering empathy and connection. They are our lifeblood. The very thing that gives us meaning and a sense of purpose in the world. Stories help fill in the missing pieces of our lives. They are the pathway to healing, self-acceptance, peace, love, joy, and abundance. There is no such thing as “perfect”. We are all doing the best we can with what we’ve been given. Our story doesn’t end there. If you tell me a story about your good father, I take that story in and your father becomes my father as well. If you are hurting or made a mistake or feel scared, I hold your hand and tell you with certainty that I’ve been there too. You are not alone. And you can believe me because, like you, I am also human. There is nothing you’ve experienced that your human counterparts haven’t experienced as well. We are all in this together and it’s time we started acting like it. If you can let yourself be seen, in all your imperfect glory, the world will be better for it. I will be better for it. I long to hear your story. I need to know I am not the odd girl out. I also need to know there are new experiences waiting to be discovered. I need to hear about the places you’ve been before I can know them as a possibility for myself. Just as the words of others have helped me discover the words within myself, so your story offers me a new perspective: I’m enough, just as I am. Your story gives me permission to be myself without fear of judgment or failure. My story does the same for you. If you are new to this sharing-your-story-thing, start slowly. Start with someone you can trust with your truth. Then, when you are feeling more confident with your voice and your particular tale, expand your circle and share it with a world of people.